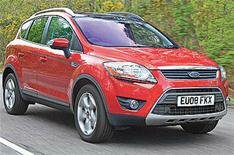 Ford Kuga range expanded | What Car? Ford has expanded its Kuga 4x4 range to include a greener and a more powerful model. The greener model is based on the existing Kuga 2.0-litre TDCI, but is front-wheel-drive only. As a result it emits 159g/km of carbon dioxide, down 10g/km from the four-wheel-drive model. The lower emissions mean that, from next April, owners will save money on VED road tax, while business buyers will be eligible for a 20% annual write down allowance against Corporation Tax, as opposed to 10% for vehicles that emit more than 160g/km. A more powerful, four-wheel-drive model will also be available. It will be powered by a 197bhp 2.5-litre petrol engine, which can pull it from 0-62mph in 8.2sec. Although a six-speed manual gearbox will be sold as standard, buyers will also be able to opt for a five-speed automatic gearbox.